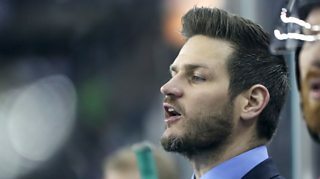 Belfast Giants coach Adam Keefe explains how he followed the closing stages of Elite League title rivals Cardiff Devils' defeat by Coventry Blaze on his mobile phone in a taxi on the way to the Giants' end-of-season award presentation on Sunday evening. The Devils' 3-1 reverse meant that the Giants lifted the Elite League title by virtue of having achieved more regulation wins. Keefe arrived at a Belfast hotel in time to celebrate with Giants players, officials and supporters.